Chennai, April 6: Framing to come together in order to hold a joint exercise off, Korean Coast Guard ship BADARO took part in Indo-Korean joint anti-piracy, search and rescue exercise SAHYOG-HYEOBLYEOG 2018 off the Chennai coast yesterday. 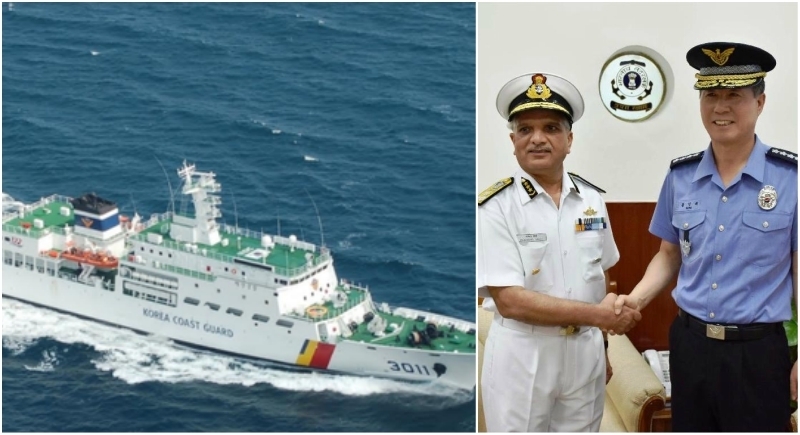 As part of the exercise, ships of the Indian Coast Guard and the Korean vessel undertook tactical manoeuvre and "drills" to counter piracy and carry out maritime law enforcement tasks off Chennai coast. It said, the exercise demonstrated a scenario in which RECAAP which is a focal point in Korea however reported loss of communication with cargo vessel South Korean flag MV Hyun Tau and it was indicated that the vessel has been hijacked by pirates. Subsequently Korean Coast Guard ship Badaro in Bay of Bengal was alerted. Indian Coast Guard deployed a Dornier aircraft to carry out sea-air coordinated search along with ICG Shaurya, Rani Abbakka, C-423, C-431. Director General of Indian Coast Guard Rajendra Singh and Commissioner of Korean Coast Guard General Park Kyung reviewed the exercise. With the conduct of the exercise, Coast Guard has reaffirmed its dependability for maritime security.